A Russian Soyuz rocket launches the unmanned Progress 62 cargo ship toward the International Space Station on Dec. 21, 2015 from Baikonur Cosmodrome in Kazakhstan. A robotic Russian cargo ship packed with tons of food, equipment - and just maybe some holiday treats - launched into orbit today (Dec. 21) in a special delivery to the International Space Station, just in time for Christmas. 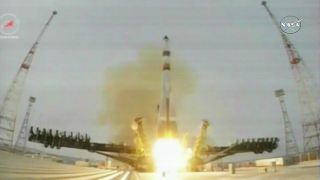 The unmanned Progress 62 spacecraft launched into orbit on a Soyuz rocket at 3:44 a.m. EST (0844 GMT), though it was 2:44 p.m. local time at its Baikonur Cosmodrome launch site in Kazakhstan. Progress 62 is carrying more than 2.8 tons of supplies for the space station's six-man crew. it should arrive on Wednesday (Dec. 23) and park itself at an Earth-facing docking port on the station's Pirs module by 5:31 a.m. EST (1031 GMT). Today's Progress 62 launch comes during a busy day for the space station, where two American astronauts will take an unscheduled spacewalk to fix a stalled railcar used by the station's robotic arm. You can watch that spacewalk live here. It begins at 8:10 a.m. EST (1210 GMT). Russia's Progress spacecraft are workhorse cargo ships designed to fly autonomously to the International Space Station to deliver supplies. At the end of their mission, the disposable Progress vehicles are filled with trash and unneeded items, and ultimately burn up in Earth's atmosphere. The launch of Progress 62 marks the second cargo delivery flight to the space station this month. On Dec. 6, a Cygnus spacecraft built by the U.S. company Orbital ATK launched to the station. The Cygnus (also unmanned) arrived on Dec. 9, delivering more than 7,000 lbs. (3,175 kilograms) of supplies to the station.